Demonstrating what the company describes as its continued commitment to the contribution and distribution (C&D) market, Ericsson is featuring the next evolution of its in-house developed professional chip, designed for video applications, at IBC. 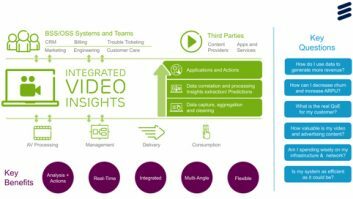 With consumer demand driving higher quality video experiences, Ericsson says that its chip ensures that content owners and service providers can respond to these challenges by ensuring the best possible picture quality throughout the media delivery chain. According to Ericsson, it continues to be a market leader in this sector, with the highest rate of deployment for C&D encoding and decoding equipment and digital satellite news gathering (DSNG) encoders. Ericsson is introducing product support for new technologies — the HEVC compression standard and the new DVB-S2X satellite digital broadcasting standard — that the company says are fundamental to the future of C&D market. The company is also demonstrating how it believes it offers the complete suite of tools for the most demanding C&D applications, including multiple low-latency processing modes, 4:2:2 sampling and 10-bit precision, all in a powerful software-programmable engine designed to deliver the processing power needed to deal with higher bit rates.